Ever wonder what Reis O’Brien’s adorable Tiny Ghost character would look like as a member of the Teenage Mutant Ninja Turtles? Well, now we know thanks to this awesome new “Tiny Ghost TMNG” t-shirt! If only we could get a matching toy release of these Tiny Ghost Teenage Mutant Ninja Ghosts. I’d kill for Tiny Ghost versions of Leonardo, Donatello, Michelangelo and Raphael. 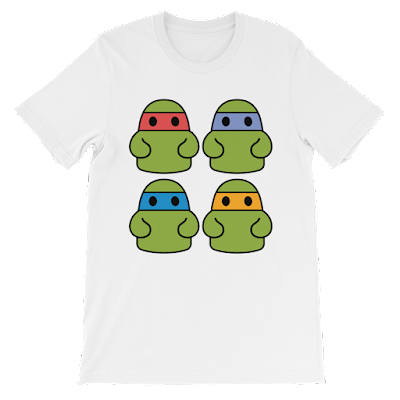 The “Tiny Ghost TMNG” T-Shirt by Reis O’Brien is available now, in sizes S-4XL, at the Bimtoy online store for just $20.